Vetta Computer Batteries and Battery Caps RT Series Head Unit Battery Cap. Vetta 196370. Vetta Computer Batteries and Battery Caps V100 Series Head Unit Battery Cap. Vetta 196491. 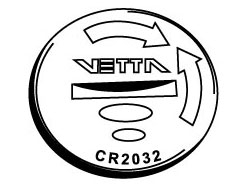 Vetta Computer Batteries and Battery Caps Wireless Transmitter Battery Cap for RT and V100 computers. Place the Cycling Computer or other facilities right in the field of your vision. Making space from the Stem, and spares more space from your handlebar.